It is raining right now, hurray, but rain cannot be counted on here in the Southwest. For certain flower and vegetable beds, soaker hoses or permanent drip-irrigation systems are not an option and my house, but "ollas" (Spanish for jug) work, even in our heavy clay foothills soil. Supposedly this is an old Pueblo Indian technique—bury an unglazed clay pot with just the neck showing and then fill it as needed. The top photo shows two models. The vinegar jug at left (heavier than a milk jug) is pierced with multiple holes (that do not show up well), made with a hot awl. 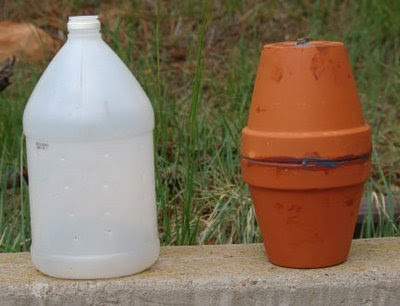 The other olla consists of two flower pots joined by Blue RTV Silicone and with a stopper in the lower pot's drain hole. 1. Plastic jug: Quick, easy, cheap, but will disintegrate from ultraviolet light in two years. 2. Clay pots: Breakable, must be purchased, last longer, diffuse water more gradually. 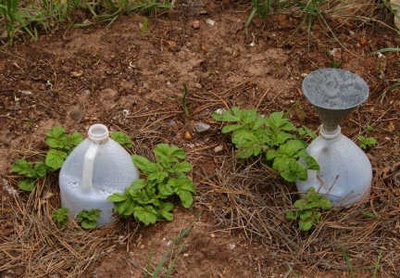 Here are two jugs with potatoes planted around them, the photo having been taken in early June. The funnel is for filling. In clay soils, the water will not seep out very far from the jug, so plants must go right next to it. The pine needles are mulch—a little difficult to arrange, but free for the gathering nearby. Surface watering on clay soil often pools and runs off, but the jugs can release water deeper down, within a small radius. You can also get hollow terra cotta spikes that fit on the end of wine or soda bottles and let water trickle slowly out. I'm experimenting with these in my upside down tomato pots - though here in the 'diftless' area of MN we have loess soil and plenty of rain. Those do sound like a good idea for container plants, but I haven't seen them here. Perhaps I was not looking in the right places. The ones I have are called Plant Nannies, I got them as a gift. I'll ask my friend where she got them. The googles would probably know. I also got some perforated plastic cones you fill with sand and put over the neck of a bottle. I got those at the local garden store. Cheap - about a buck each, and work fairly well - though they drain faster than the terracotta ones.